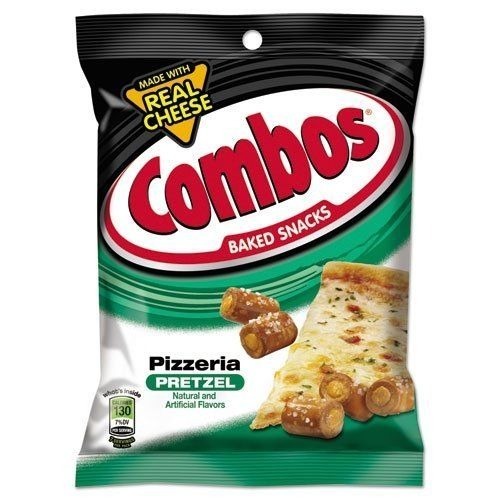 A new Combos product for you! Delicious baked pizza crusts filled with a tomato pizza flavoured filling. Wheat Flour, Vegetable Oil (Palm Kernel Oil, Palm Oil and/or Hydrogenated Palm Oil), Whey, Maltodextrin, Food Starch-Modified, Salt, Tomato; Less than 1.5% of: Corn Flour, Leavening (Baking Soda, Sodium Acid Pyrophosphate), Dextrose, Bakers and Cheddar Cheese (Milk, Cheese Cultures, Salt, Enzymes), Buttermilk, Artificial and Natural Flavors, Onion, Soy Lecithin, Spice, Garlic, Coloring (includes Yellow 5 Lake, Yellow 6 Lake, Red 40 Lake, Blue 1 Lake), Lactic Acid, Citric Acid, Whey Protein, Malic Acid, Sugar, Disodium Inosinate, Disodium Guanylate, Hydrolyzed Soy Protein, Paprika Extract (Color).